Bishop Bay-Monkey Beach Conservancy protects one of the most popular marine hot springs and boat anchorage site along the Inside Passage. Local boaters, as well as those going to or coming from Alaska, commonly stop at Bishop Bay for hot springs soaking, safe anchorage, picnics and camping. This very popular recreation site includes a boat dock and ramp, boardwalk, tent platforms, pit toilet, and bath house for soaking. The Monkey Beach area also protects a number of attractive small beaches, camping spots, important intertidal habitats and traditional shellfish harvesting areas by local First Nations. Mooring Buoys: In September 2010, BC Parks with the help of Canada Coast Guard, installed two mooring buoys at the end of Bishop Bay. In June 2015, a third mooring buoy was installed with the help of Canada Coast Guard. Special Feature: A bath house is provided so that park visitors may enjoy soaking in the warm and odorless hot springs water. The hot springs water comes out of the ground from a crevice in the granodiorite bedrock beside the bath house. It flows out at a rate of about 32.4 litres per minute. Water temperature at the source is about 41.3 degrees Celsius and about 38.8 degrees Celsius in the bath house. This conservancy is closed to Grizzly Bear hunting. The water in the hot springs is not suitable for drinking. To prevent overcrowding and damage to the dock and shifting of dock anchors, boats over 11 metres (36 feet) are requested to anchor offshore. Please only use soap and shampoo in the outer tub/pool. This will help to keep the water cleaner in the inner soaking tub/pool. Bishop Bay-Monkey Beach Conservancy is only accessible by boat or floatplane and is located about 25 km east of Hartley Bay and 75 km south of Kitimat. It is located along the east side of Ursula Channel, east of Gribbell Island. History: Bishop Bay-Monkey Beach Conservancy was designated as a conservancy on July 14, 2006, with the Monkey Beach area added on May 31, 2007 following recommendations from the North Coast Land and Resource Management Plan. Prior to being designated as a Conservancy in 2006, Bishop Bay hot springs was a BC Forest Service Recreation Site maintained by the North Coast Forest District out of Prince Rupert. The hot springs bath house was originally built in the 1960’s by volunteers from the Kitimat Yacht Club. Cultural Heritage: The conservancy is in the asserted traditional territories of the Haisla, Gitga’at and Gitxaala First Nations. The conservancy contains five known archaeological sites (pre-contact shell middens, plank house depressions, faded pictographs) and has historically been used for the traditional harvest of shellfish and trapping by local First Nations. Monkey Beach got its name from legendary sightings of monkey-like creatures (Sasquatch) by local First Nations. Use the below links for more information or to contact these First Nations. Conservation: The conservancy protects an area of cultural and historical value to the local First Nations as well as high recreational use and old-growth forests of red cedar and hemlock, portions of small coastal streams and coastal wildlife habitat that includes the marine foreshore and intertidal areas. Wildlife: Bears, wolves, and sometimes deer can be seen along the shoreline. Humpback whales, killer whales, Dall’s porpoises, Pacific white-sided dolphins, sea lions and harbour seals can also be seen in the adjacent marine waters. Kermode bears are commonly seen on Gribbell Island, to the west of the conservancy. BC Parks is in the process of developing a management plan for this conservancy. Adventurous and experienced kayakers may enjoy exploring the bays and shorelines in this conservancy. There may be opportunities for fishing in the streams near the shores of the conservancy. Please consult the appropriate non-tidal fishing regulations for more information. Anyone fishing or angling in British Columbia must have an appropriate license. It is possible to SCUBA dive or snorkel in the conservancy. The water clarity is best during winter and spring. Bears, wolves, and sometimes deer can be seen along the shoreline. Humpback whales, killer whales, Dall’s porpoises, Pacific white-sided dolphins, sea lions and harbour seals can also be seen in the adjacent marine waters. Kermode bears are commonly seen on Gribbell Island, to the west of the conservancy. There are two trapper’s cabins built by the Haisla First Nation that are available for public use inside the conservancy. The cabins are 15’ x 12’ with 2 double bunk beds. The cabins are available on a first-come, first-served basis. Be prepared to sleep outside if the cabins are full. There are sheltered boat anchorages near both cabin locations. One cabin is located by the mouth of the creek that enters into Bishop Cove. UTM coordinates are: Zone 09U; 5926496 m North; 0502527 m East. The other cabin is located at Monkey Beach, behind a small tombolo island about halfway between Riordan Point and Bishop Cove. There is no fresh water source by this cabin. UTM coordinates are: Zone 09U; 5923125 m North; 0501175 m East. There is a third cabin which is located outside of the conservancy, but nearby in Boxer Reach, on the east side of Gribbell Island, on a gravel spit about 1.25 nautical miles NW of Riordan Point. There is no fresh water source by this cabin. UTM coordinates are: Zone 09U; 5923550 m North; 0503586 m East. 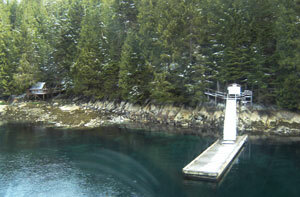 A campfire ring & grate was installed in July 2012 beside the Haisla First Nation trapper’s cabin at Monkey Beach. Firewood is not provided. If you must have a fire, please burn only dead and down wood, and be sure to fully extinguish the fire when done. Dead wood is an important habitat element for many plants and animals and it adds organic matter to the soil so please use it conservatively, if at all. We encourage visitors to conserve wood and protect the environment by minimizing the use of campfires and using camp stoves instead. Limited burning hours or campfire bans may be implemented during extremely hot weather conditions. Bishop Bay hot springs has a day-use/picnic area. Facilities include a covered 8 ft. x 16 ft. cement bathhouse for soaking in hot springs water, one composting pit toilet, three tent platforms and three mooring buoys. The UTM coordinates for the hot springs and bath house are: Zone 09U; 5924660 m North; 0510822 m East. The three mooring buoys at the end of Bishop Bay are available on a first-come, first-served basis. There is a composting pit toilet which is located just past and to the north of the hot springs bath house. Wilderness, backcountry or walk-in camping is allowed. Two mooring buoys have also been installed at the end of Bishop Bay. A short boardwalk trail from the boat dock at Bishop Bay heads south approximately 100 metres to a small camping area that has three elevated tent platforms (12 ft. x 12 ft.) and a campfire pit. Another short boardwalk trail from the boat dock heads north approximately 100 metres to the picnic shelter, hot springs bath house and pit toilet. Reservations are not accepted at this conservancy and all sites and facilities are on a first-come, first-served basis. Location: Ursula Channel, east end of Bishop Bay on the north side, about 65 km south of Kitimat. Facilities: Wood frame and concrete block bathhouse (8’ x 16’) just above high tide line with two soaking pools. Overflow water from the larger covered inside pool feeds a smaller pool outside. Bathhouse has a change room with bench and coat hooks. Facilities also include a deck, dock, mooring buoys, composting pit toilet, boardwalk trail, 3 tent platforms and information shelter. Comments: The waters are odorless. Boats over 30 ft. are requested to anchor offshore and not tie up to the small dock. Use soap and shampoo only in the outer pool.